MyHDL is an open source Python package that lets you go from Python to silicon. With MyHDL, you can use Python as a hardware description and verification language. Furthermore, you can convert implementation-oriented MyHDL code to Verilog and VHDL automatically, and take it to a silicon implementation from there. I don’t know if MyHDL will become a widespread description language for hardware blocks, but I see a lot of potential for testbench and verification. Verilog and VHDL become narrow when you need to write a high-level block, so it comes natural to use a higher-level language; but SystemVerilog and SystemC (the industry most popular ones) have a steep learning curve with respect to Python and MyHDL. Moreover, hardware design projects often need the creation of tools to assist the simulation and verification flow (for example parsing the simulation output, or stimulus data generation); if a designer is already proficient in MyHDL, then those tools can be quickly done in Python. MyHDL can be downloaded from its sourceforge project page, but I wanted to ease the installation on Ubuntu and the subsequent software updates, so I “debianized” the package (following the complete packaging guide from Ubuntu wiki) and put it on my Launchpad PPA. In order to install MyHDL, the procedure is the following, and is very similar to that explained on this gnome-do tutorial. 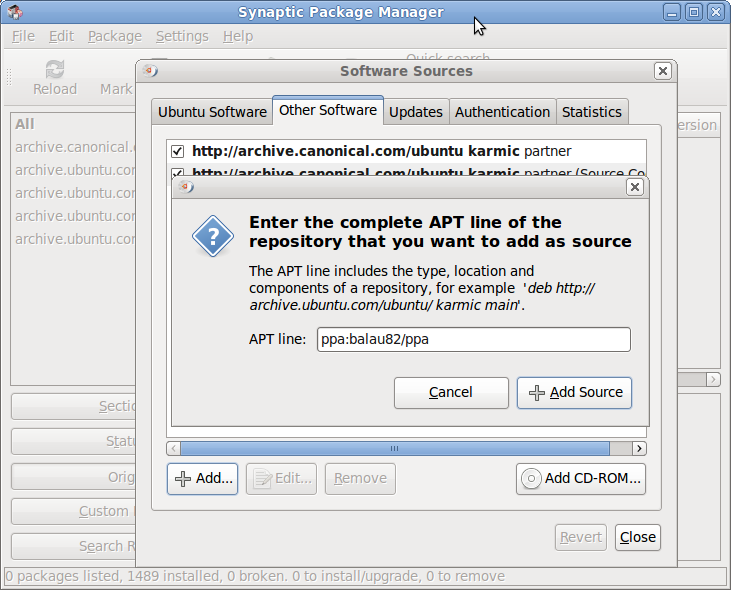 Open Synaptic from the main menu: System –> Administration –> Synaptic Package Manager (insert the password). Open the repository settings from the Synaptic menu: Settings –> Repositories. In the “Other Software” tab, click the “+ Add…” button. Write “ppa:balau82/ppa” and click the “+ Add Source” button. Go to the Authentication tab, right-click in the white space and click “Add key from paste data”. Close the “Software Sources” window and click the “Reload” button on Synaptic. Search for the package with name “myhdl” and install it. This will install all the required packages for myhdl including gpg key. Thanks to Ubuntu Geek for the installation instructions. To get started, many examples are provided in “/usr/share/doc/myhdl/examples“, and more information can be found on the MyHDL cookbook.